Henry Armstrong had come so close to accomplishing the feat. Latter day legends Alexis Arguello and Roberto Duran had tried and failed. 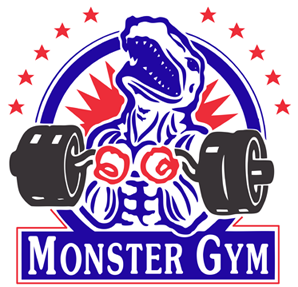 But finally, for the very first time, the mountain was conquered: four world titles in four different weight classes. And the man who did it was a legend in his own right: The Hit Man. The Motor City Cobra. Thomas Hearns of Detroit, Michigan. Say what you want about Tommy’s career being defined by losses in two of the biggest fights in boxing history against Sugar Ray Leonard and Marvelous Marvin Hagler. Fact is, there’s no shame at all in losing to a pair of legends, two of the best to ever lace up the gloves. Especially the way Tommy did it. In both cases he never gave up, never stopped trying, never stopped fighting. In both cases he had to be saved from his own courage and will to win, a referee waving his arms as Ray and Marvin breathed sighs of relief, both sporting wounds of war from the lethal fists of The Hit Man. Hearns battling Leonard in 1981. And after those losses, Hearns never stopped asking for rematches with both men. It says a lot that Hagler had no interest in locking up with Tommy again, and that Leonard avoided doing so for more than eight years, agreeing to a return only after Hearns looked washed up against Iran Barkley and James Kinchen. Both could have made millions fighting “The Hitman” a second or third time, but neither was anxious to face again a determined competitor who sported a wicked left jab, a devastating right hand, killer instinct to spare and a passion for combat. 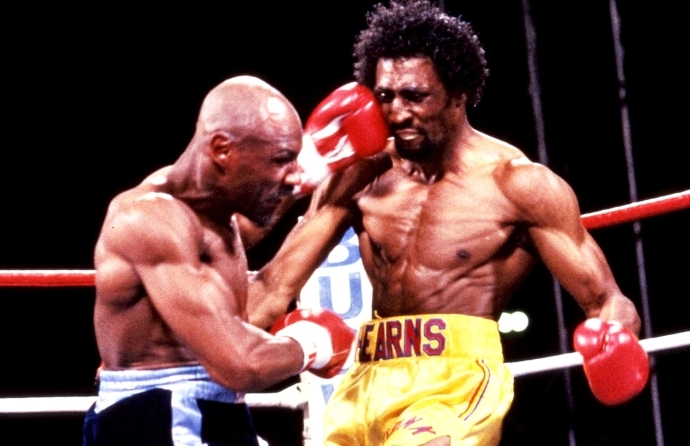 At his best, Hearns was more than formidable; he was terrifying. But not invincible. 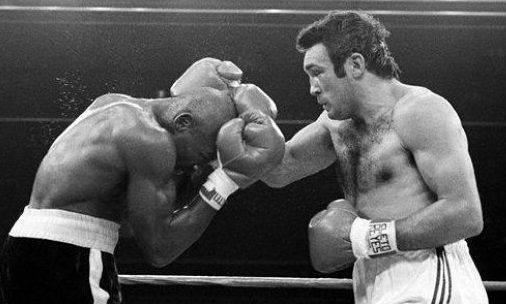 Tommy’s chin was generally dependable but a bit on the shaky side, and while that was the chink in his armour leading to his defeats to Hagler and Leonard, it also translated into serious thrills and surprises for boxing fans. A Thomas Hearns fight was never boring; many were truly electrifying, even when you didn’t expect it. And more than once a bout that looked to be in Tommy’s back pocket was snatched away by a single devastating blow crashing into his mandible. Hearns rumbles with Hagler in ’85. It almost happened against Juan Roldan when they clashed for the vacant WBC middleweight title. 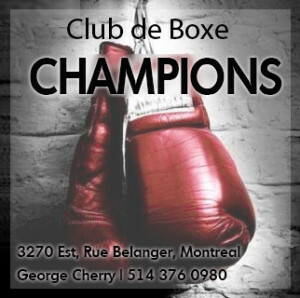 Hearns — who had previously taken belts at welterweight, super welterweight and light heavyweight — was favoured to add a major milestone to his Hall of Fame career and be the first ever to win four divisional world titles. His advantages in height and reach and superior boxing skills were thought to give him a decided advantage. 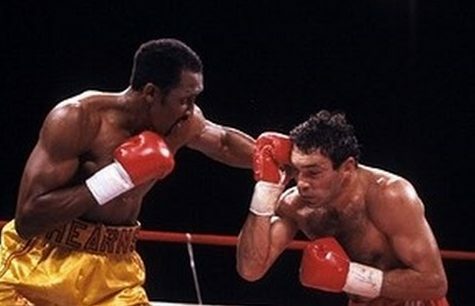 But at the opening bell the tough Argentinian, who had given Hagler a rough battle back in ’84 and had stopped Kinchen six months before, stormed out of his corner and forced Tommy into a toe-to-toe slugfest. This was Las Vegas after all, so one could say that Roldan was making the boldest of gambles, betting that aggressiveness, pressure and Tommy’s unpredictable chin could combine to make him the highest of the high-rollers that night. But the plan almost back-fired less than a minute in when Roldan found himself taking a count after Hearns scored with two hard right hands. 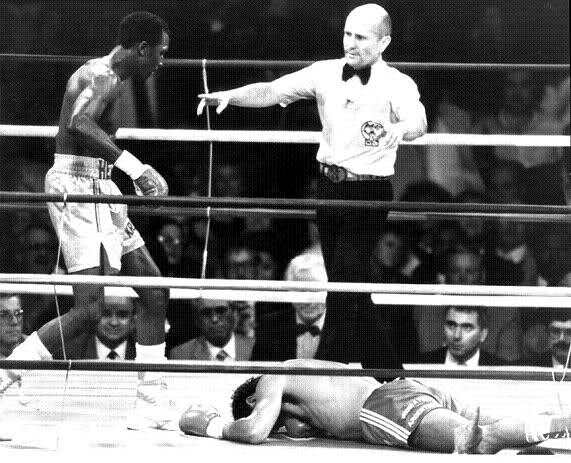 Hearns tried to finish the job but was nailed himself by heavy rights from Roldan and suddenly it was a dazed Tommy hanging on and waiting for his head to clear. Roldan, winging right hands, chased Hearns all over the ring but then, just as the bell rang, he was clocked by a big right from “The Hit Man” and toppled face first. Roldan barely beat the count to end one of the wildest opening rounds in recent memory. Roldan surprised many by giving Hagler a tough fight in 1984. Surprisingly, round two saw no change in tactics from Roldan as he continued to attack and just twenty seconds in he ate a left hook for his trouble and was on the canvas a third time. He bravely rose and the non-stop brawling continued, Hearns looking to end it with a single punch as Juan kept rushing in, forcing the fight, taking heavy punishment. Tommy had abandoned his jab and both men just kept firing power shots, Hearns risking disaster as he went for the knockout. It didn’t happen and then early in round three the momentum shifted again when Roldan buckled the legs of Hearns with a right. “The Motor City Cobra” spent much of the rest of the round hanging on for dear life as “Martillo” kept fearlessly bulling forward and was grateful to hear the bell. 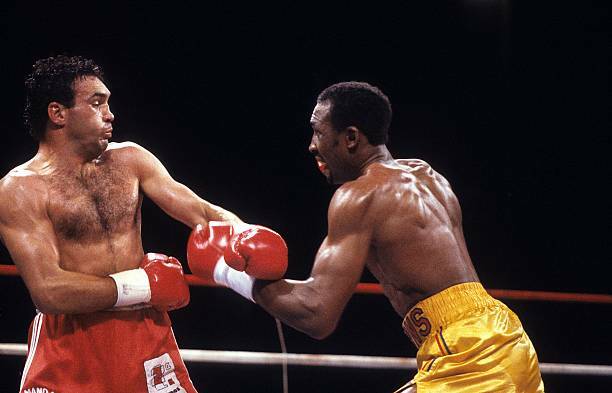 Three rounds were in the books and it Hearns vs Roldan was a ferocious war, and while “The Hit Man” had scored three knockdowns, he had been hurt numerous times and no one would have been shocked if he hit the floor as well. Seconds into round four he almost did. Roldan caught him flush with a powerful left hook that buckled Tommy’s legs again, the crowd roaring and on its feet as the underdog once more tried to finish him. But in fact Hearns still had plenty of fight left and Roldan’s gamble to try and end it then and there was a reckless one. It was also his last bet of the night. 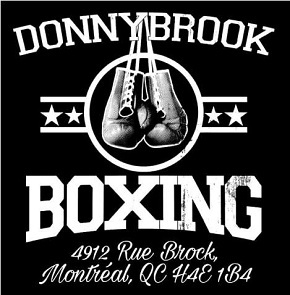 Using deft upper body movement, Tommy slipped a series of power punches, clinched to buy time, and then abruptly Hearns started firing huge shots with both hands. Roldan walked into a right that stopped him short and seconds later Hearns dug in with two big lefts to the body. Now it was Roldan’s turn to look like he was worn down and ready to go. And no one had to ask Hearns twice. Coming out of a clinch initiated by the Argentinian, Tommy slammed home another vicious left to the belly and then a crushing right to the head. Roldan toppled in sections, face first, and didn’t even try to get up, only rolling onto his back as referee Mills Lane finished the count. Roldan down and out in round four. 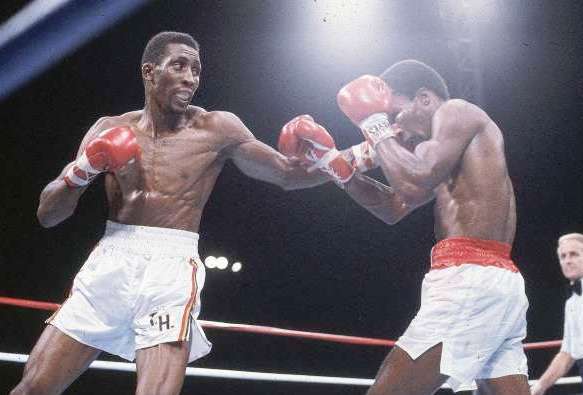 How appropriate, how fitting, that a win which set a new record, and further secured the ring immortality of Thomas “Hit Man” Hearns, was not just a thrilling, back-and-forth shoot-out, but a battle that saw Tommy almost fall to defeat. Once again “The Motor City Cobra” displayed his awesome power and will to win, but also his vulnerability, and the courage to fight past it and emerge victorious. And once again he gave fight fans more than their money’s worth. 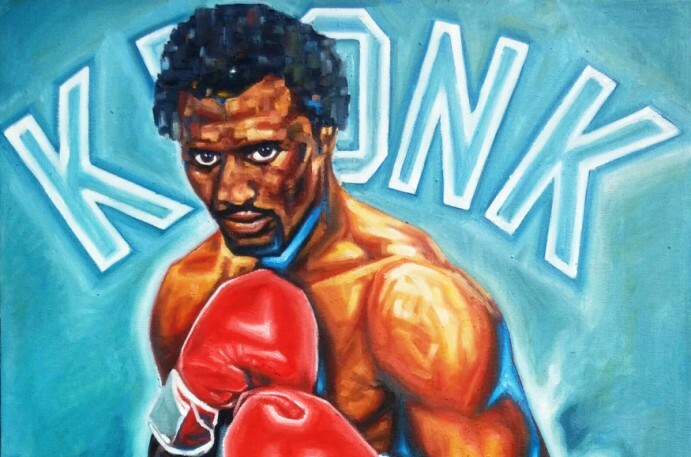 Painting of Thomas Hearns by Damien Burton.